This pattern is from Christine Springett's single patterns, "Christmas Treats 1 , 2, 3 and she has recently brought out Christmas Treats 4 , These are vey nice patterns. 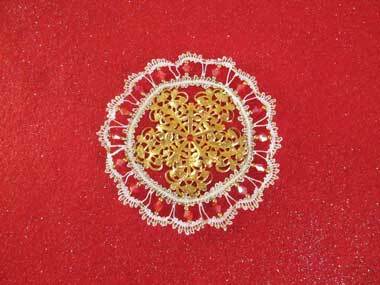 The thread is DMC 80 and gold metalic , Red ab bicone and gold spacer beads . Along with a metal centre. It is just Torchon techniques with very good instruction. I thought this was a little different.